If your house is anything like mine, Super Bowl Sunday is a good excuse to make piles of marginally healthy food, gather friends and family, and watch (at least some of) the game. If your house is REALLY anything like mine, you’ve had to look up more than once when it is and who is playing. I think it’s this weekend, and those teams are going to have quite a match up. To help hold the attention of those who have not *exactly* followed football this season, I bring you Super Bowl Ad Bingo, 2015 Edition! Playing is easy – keep a sharp eye on the ads and have your card handy. 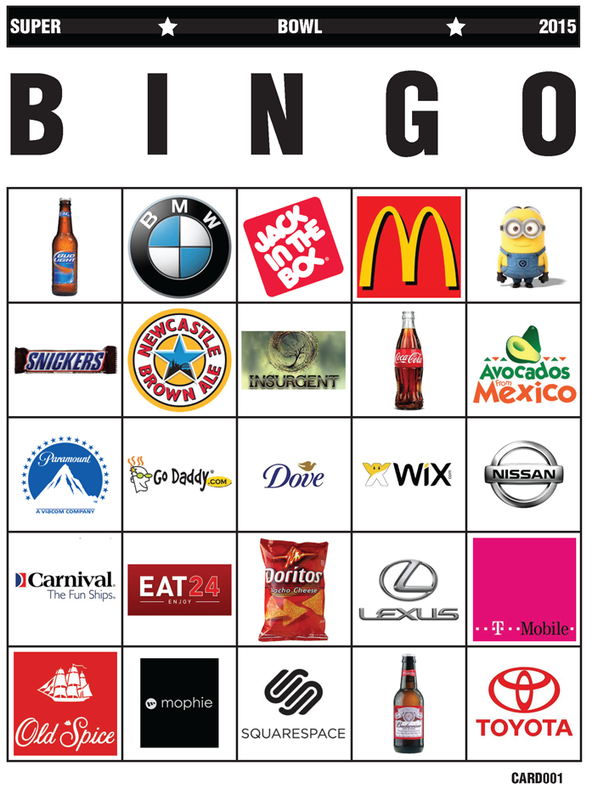 When an ad plays, check your card to see if the product or company logo is represented on your grid. If it is, mark it off. You can use a pen, chips, coins, or official bingo dauber. The game is up to you, but I like to play straight-up bingo, no four corners, no postage stamp, no blackout. First person to get bingo is the WINNER (prize is up to you).